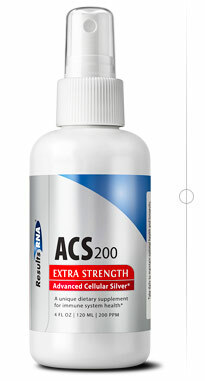 What is the main difference between Advanced Cellular Silver (ACS) 200 and ?colloidal silver? products? Advanced Cellular Silver 200 is a powerful and comprehensive antimicrobial going far beyond colloidal silver formulas in both antimicrobial and healing effect. Independent studies prove to ACS 200 Extra Strength to be far more effective in killing pathogens than Argentin, SilverMax, or any other brand of colloidal silver. ACS 200 Extra Strength is anti-viral, bactericidal, anti-fungal and anti-parasitic, killing Methicillin-resistant Staphylococcus aureus (MRSA), Candida and Rhinovirus at 99.99999% in less than 3 minutes. As performance benchmarks, these are extremely difficult pathogens to kill. Competing colloidal silver formulas have very mild antimicrobial effect when compared to ACS 200 Extra Strength. ACS 200 Extra Strength is actively prescribed by health care practitioners in over 15 countries. How safe is ACS 200 Extra Strength? ACS 200 Extra Strength has also been proven extremely safe via independent Acute Oral Toxicity Studies. Where can I view the research behind ACS 200 Extra Strength? The killing effect of any antimicrobial or antibiotic can only be determined by kill time studies. All kill time studies using ACS 200 Extra Strength have been performed using The Scientific Association Dedicated to Excellence in Analytical Methods (AOAC) standards at some of the top independent microbiological laboratories in the world. Results RNA? has sponsored over 500 kill time studies in the last 10 years alone. Does ACS 200 interrupt the floral balance in the intestine? Sustained use of ACS 200 Extra Strength by many people over years of time has not shown any evidence of destroying the floral balance of the intestine. What is the half life of ACS 200 Extra Strength? Half life is the time it takes for the blood level to decrease by half after discontinuing product use. Therefore, if ingestion of ACS 200 Extra Strength (which has a half life of 15 days) is discontinued, and the blood level at the time is for discussion sake 20, in 15 days the blood level will decrease to 10. ACS 200 Extra Strength contains a very safe size range of pathogen lethal silver particles - from 0.4 microns down to nanometer. This range of sizes acts as broad arsenal in the pathogen attack. ACS 200 Extra Strength is currently offered in a 2 ounce (single loading dose), a 2 ounce Intra-oral spray and a 4 ounce Intra-oral spray. Will weather elements affect the product (heat or cold) if when delivered if customer cannot pick up immediately, sits at home or outside a Dr's Office? What is the shelf life of the Results RNA? formulas? The reason we use the very high grade High Density Polyethylene (HDPE) plastic is because of what you have already observed; both the ACS 200 Extra Strength PPM silver and the ACZ nano Extra Strength zeolite products are very active to put it mildly. HDPE plastic is used for many packaging applications because it has excellent moisture barrier properties as well being lightweight and flexible. HDPE plastic has good resistance to chemicals, which is why it is commonly used to package many household and industrial cleaning products including detergents, bleaches, and even acids. HDPE is extremely resilient in this regard, (much more so than PET or other types of plastics, including glass) and therefore does not leech contaminants into the product. What about side effects such as the possibility of permanent bluish discoloration of the skin?Are there any instances or studies of this occurring with this product? Toxicity of silver preparations used medicinally can lead to a rare condition known as Argyria. This is a non-fatal condition where the skin turns to a silver gray color. There is absolutely no risk of Argyria associated with the use of ACS 200 Extra Strength. We also have a 15-year history of many thousands of patients using our cellular silver without complaint. As a matter of medical silver use in history, there were over 5 million prescriptions of silver dispensed in the United States in 1929. Out of those 5 million users, there were less than 60 accounts of Argyria. None of those cases were associated with colloidal silver. These cases were associated with the use of silver nitrate. What is the safety of ACS 200 Extra Strength for a woman who is trying to become pregnant or who is pregnant? ACS 200 Extra Strength can be safely taken by pregnant women when following the daily dose guidelines.